Southern Illinois University Edwardsville Associate Chancellor for Diversity and Inclusion Venessa Brown, PhD, today introduced the University’s Diversity and Inclusion Strategic Plan Goals for 2018-25 at the Morris University Center Conference Center. The plan focuses not only on enrollment growth for underrepresented students, but also retention of those students with an emphasis on high impact community engagement practices during their time at SIUE. Another key focal point for SIUE is attracting and retaining faculty and staff from underrepresented groups. To address campus climate issues and complex societal issues facing the region and nation, SIUE is committed to increasing dialogue regarding diversity and inclusion issues, such as the sustained dialogue program, biweekly Friday conversations and town halls already taking place. The plan also includes building a community that fosters learning, scholarship, and creative activities that reflect understanding of global diversity, and a commitment to inclusion and social justice. A core value of the SIUE community is improving upon a campus climate that acknowledges, embraces and celebrates diversity and inclusion. 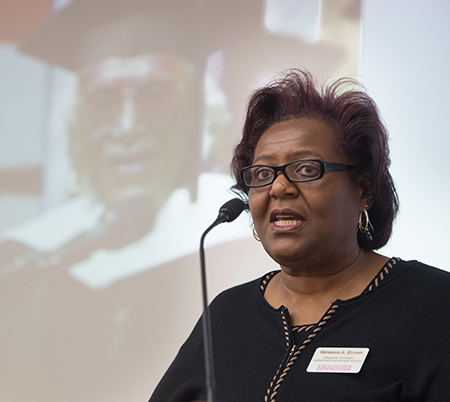 Photo: SIUE Associate Chancellor for Diversity and Inclusion Venessa Brown, PhD, addressed approximately 150 people as she introduced the University’s Diversity and Inclusion Strategic Plan Goals for 2018-25 at the Morris University Center Conference Center.